Where can you find the most interactive, family-friendly green fair in Chicago? Check out the Green Metropolis Fair, hosted by Mindful Metropolis magazine and Green Parents Network! April 16, 10am-4pm, at the Irish American Heritage Center (IAHC), 4626 N. Knox Ave., Chicago. The festival features an amazing day of activities for both adults and children with an emphasis on fun for the whole family. Chickens! Home to Roost will have a vendor table and a panel discussion from 12 to 1 PM. Petting zoo! Children will get an opportunity to pet goats, rabbits and other furry critters! Vanishing of the Bees explores the lives of honeybees and the phenomenon known as Colony Collapse Disorder associated with the mysterious disappearance of honeybees across our planet. Green Merchants! The festival also features a retail marketplace where vendors from all over the Chicago area will be selling their wares. Admission is free, but a non-perishable food item donation is requested. All are welcome regardless of ability to donate. The IAHC is conveniently located off I-90/94, the CTA Blue Line stop at Montrose and multiple bus routes. There is also ample free parking. 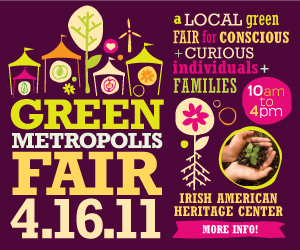 Visit www.greenmetropolisfair.com for more details, call 312.281.5199 or email info@mindfulmetropolis.com. This event is part of the MindfuLive! Event Series. More information about these events can be found at www.mindfulmetropolis.com. Mindful Metropolis magazine and Green Parents Network will host a Green Metropolis Fair on April 16, from 10am-4pm, at the Irish American Heritage Center (IAHC), 4626 N. Knox Ave., Chicago. The festival features an amazing day of activities for both adults and children with an emphasis on fun for the whole family. Learn how to compost effectively in the city with the Urban Worm Girl, Stephanie Davies, get information on keeping backyard chickens, growing and preserving fruits and vegetables year-round in small spaces and participate in interactive workshops. Suppliers and contractors will showcase tips to make your home energy-efficient and sustainably beautiful, while children will get an opportunity to pet goats, rabbits and other furry critters! Along with the interactive experiences, the festival will screen two films: Dirt! The Movie, narrated by Jamie Lee Curtis, this film focuses on the wonderment of the soil. “Made from the same elements as the stars, plants and animals, and us, dirt is very much alive.” And, Vanishing of the Bees, which explores the lives of honeybees and the phenomenon known as Colony Collapse Disorder associated with the mysterious disappearance of honeybees across our planet. The festival also features a retail marketplace where vendors from all over the Chicago area will be selling their wares. Try out a Balance Board, feel the softness of organic baby and children’s clothing, smell the relaxing aroma of naturally scented soy candles and marvel at the talent of local artisans who turn stones to beautiful jewelry and repurpose ordinary items into fine home furnishings. Visit http://www.greenmetropolisfair.com for more details, call 312.281.5199 or email info@mindfulmetropolis.com. This event is part of the MindfuLive! Event Series. More information about these events can be found at http://www.mindfulmetropolis.com.